Can less water grow better berries? It might be pouring rain today, but soon enough California will be dry again. As demand for water for a growing urban population and for environmental restoration increases, farmers throughout the state are working to grow crops using as little water as possible, and UC is working with them. "Water supplies are being constrained. Farmers are facing reduced access to water," said Shermain Hardesty, a UC Cooperative Extension specialist in the Department of Agricultural and Resource Economics at UC Davis. 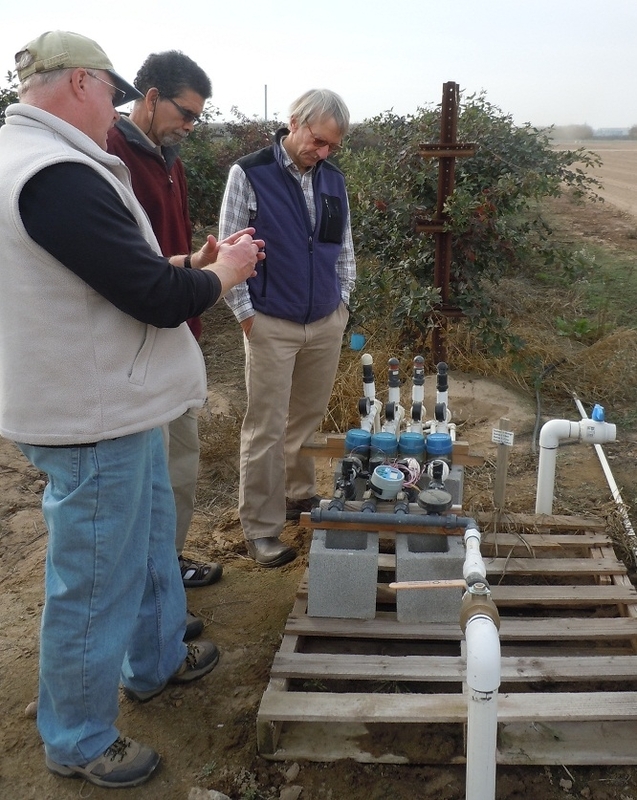 UC Cooperative Extension scientists (left to right) Larry Schwankl, Aziz Baameur and Mark Gaskell with irrigation metering equipment. A team of researchers, led by Hardesty, is in the middle of a three-year investigation into the effects of different irrigation levels on the quality, shelf-life, nutritional content, sensory quality and yield of some delicious annual and perennial crops. They're trying to learn if some of our favorite treats - strawberries, blueberries and blackberries - can be even more tasty if they're grown with less water than usual. The research involves using some elaborate formulas for determining how much water is needed. UCCE advisor Richard Molinar, working with small farms in Fresno County, is irrigating small plots of strawberries with different amounts of water, some at 125 percent of the normal rate, some at 100 percent, and others at 75 percent and 50 percent of normal. In San Diego County, UCCE advisor Ramiro Lobo is doing similar research on strawberries and blueberries; UCCE advisor Manuel Jimenez is working with blackberries and blueberries in Tulare County; UCCE advisor Aziz Baameur is planting strawberries and blackberries in Santa Clara County, and UCCE advisor Mark Gaskell is studying blackberries in Santa Barbara County. Once the berries are grown, they need to be tested - and testing means tasting in this project. The research team is holding tasting sessions to let the public judge which berries they prefer. If you've ever tasted a dry-farmed tomato, you might guess the answer. The first tasting session was held at the Davis Farmers' Market in June, with seven more coming soon at farmers' markets and grocery stores around the state. Taste is a great quality to measure, but only one aspect of the study. Berries are already known for having a high nutrient content, but growing them with less water might give them even higher nutritional value. The team expects to find nutrition density to be highest at the lowest irrigation levels. To test this concept, UCCE specialists Elizabeth Mitcham and Marita Cantwell, experts in postharvest science affiliated with the Department of Plant Sciences at UC Davis, are doing nutritional quality analysis of the berries as they are picked. A berry bush that is receiving 50 percent of reference evapotransporation. Because they have to deal with so many variables, from weather to pests to unexpected competition and volatile prices, farmers are often called gamblers. Because of all these uncertainties, farmers are likely to try to control what they can. Research team member Lawrence Schwankl, a UCCE specialist in the Department of Land, Air and Water Resources at UC Davis, says that many farmers are currently over-watering many crops. "Over-irrigation is cheap insurance, especially for such high value crops," he said. He explained that more water tends to grow bigger berries. Since the harvest is not mechanized for berry crops, it takes as much effort to pick a small berry as a large berry, making more efficient use of the pickers' time and filling the basket more quickly if the berries are bigger. Such a trade-off for the farmers! The public may decide that they prefer smaller berries with more taste, and the scientists may decide that smaller berries are more nutritious, but will it be profitable to grow better berries? It may depend on how much smaller, and on how much less water for how much better nutrition and taste. It may depend on the water rates, says Hardesty. She will be taking all of these variables into account to determine the potential impact on profitability of lower irrigation rates on berries. The team, which also includes UCCE advisors Michael Cahn in Monterey County and David Shaw in San Diego, will report the results of their study to California farmers in the final year of the project. This project is funded by a California Department of Food and Agriculture Specialty Crop Block Grant. A berry bush that is receiving 125 percent of reference evapotransporation. 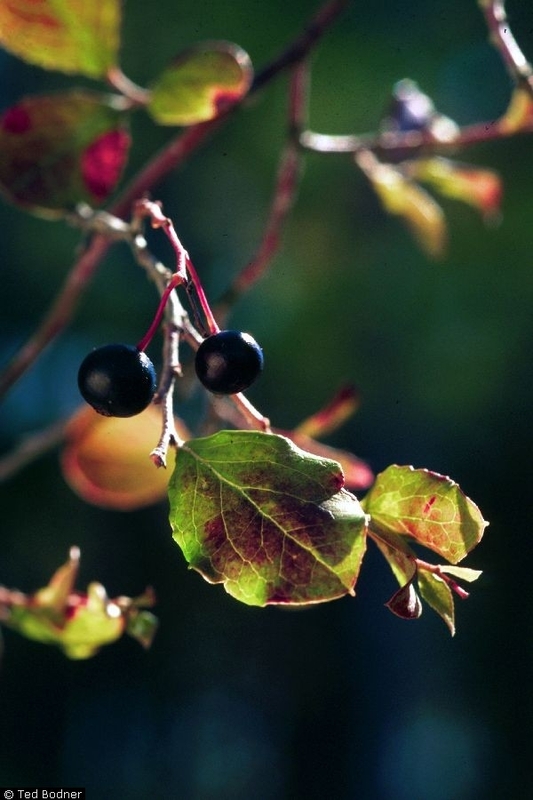 The farkleberry is related to blueberry, but more tolerant of alkaline soil. California consumers have grown accustomed to enjoying locally grown blueberries in the last decade. Much of the credit goes to UC Cooperative Extension advisor Manuel Jimenez of Tulare County, who has been studying blueberry production and varieties at the UC Kearney Agricultural Research and Extension Center since 1998. 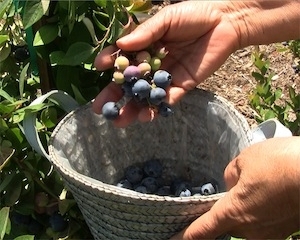 California’s abundant sunshine enables growers to produce high-quality, very sweet Southern Highbush variety blueberries. But, blueberry plants are difficult and expensive to establish and maintain, in part because of California's soil chemistry. For example, a 2009 Blueberry Cost Study produced by UC Davis calculated that equipment needs for acidification - including a storage tank, pump and monitoring kit - amounts to $5,500. In addition, the growers must purchase large quantities of sulfuric acid to add to the soil and irrigation water. Reducing acidification cost is the goal of a new blueberry trial at Kearney, in which Jimenez has grafted the most common commercial blueberry varieties on the roots of farkleberry plants (Vaccinium arboreum). Farkelberry is a small, stiff-branched evergreen bush that is more tolerant of alkaline soils than blueberries. So far, the two-month-old plants seem to be growing well in their naturally alkaline soil. The coming years will reveal whether using this technique will improve the economic viability of California blueberry farms and provide California consumers with local, healthful and delicious blueberries at a reasonable cost. The project is being conducted in collaboration with Oregon State University and Florida State University. 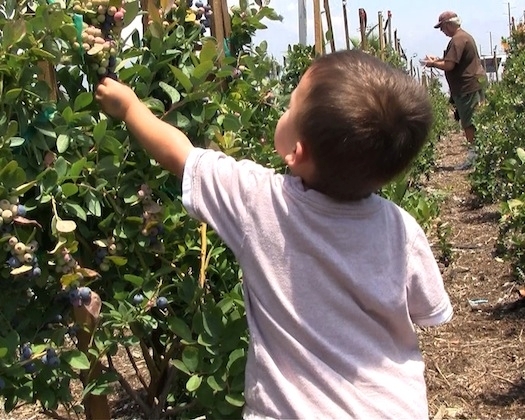 This season, for Southern California pick-your-own foodies, blueberries are among the latest and fastest growing offerings, thanks to the tenacity of small-scale farmers and the know-how provided by UC Agriculture and Natural Resources experts. Although U-pick produce operations have been around for many years, farmers who let you hand-pick your blueberries was unheard of in this part of the state until recently. We may have to thank UC Cooperative Extension farm advisor Manuel Jiménez, who's work on cultivars that he planted in 1997 at the UC Kearney Agricultural Research and Extension Center in Parlier has resulted in about 30 million pounds harvested in about 6,000 acres this year in California, mostly in the San Joaquín Valley. A few days ago, my wife, Sylvia, and I decided to try our hand at picking our own berries at Soffel Farms in Redlands. 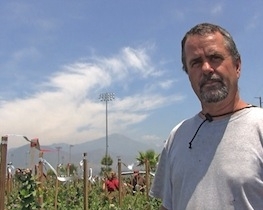 It's one of the few local urban farms, or rather farms that became urban in the Inland Empire Area, which is San Bernardino and Riverside counties. Ron Soffel of Soffel Farms, Redlands, Calif.
For the second year in a row, Soffel Farms is letting customers harvest as much as they want of its blueberries. This year, Ron Soffel is seeing people who drive more than a hundred miles to do just that. "They don't see these around here, the closest are when you go up north to the San Joaquín Valley," he said of the blueberries as a new local crop. By word of mouth, and of quite a few bloggers, locals and not so locals are showing up to pick the micro-nutrient rich blueberries, which many foodies see as magic pills in the fight against some types of cancer and obesity-related diseases like diabetes. Of course, an incredible flavor helps too. For sure, pickers leave with a better understanding of what it's like to grow and harvest the foods that keep us healthy. "Once they come up, and experience it, they come back," said Soffel. Walk carefully along the rows of bushes so do not damage the plants. After you've picked enough, you go back and your berries are packed in 12 oz. plastic containers for which you pay $5 each. I confess, my wife and I didn't wait until we got home to make sure we had gotten the most delicious blueberries we'd ever tasted! Once you taste a handpicked blueberry, it's hard not to eat some of the ones that should go into the basket. I felt less guilty after seeing Soffel do the same as we spoke. Other visitors did it too, including a five-year-old who was accompanied by his grandparents, from San Diego. None of his blueberries went to a basket, but straight to his tummy. "Purple!" he told me every time he put one in his mouth as we went along picking berries. He was the proverbial kid in a candy store. Thank goodness there was lots of that Mother Nature's candy. As a consumer, I'm thankful that we have our own Manuel Jiménez, who tirelessly proved that blueberries could and should be added to the California cornucopia. And also for the determination of small growers like Soffel in keeping the agriculture tradition alive. Although many farmers in California are now finding that blueberries are relatively easy to grow, Soffel says it's labor intensive. But it's helping him to keep his family tradition. Like many small-scale farmers, Soffel depends on direct sales. Adding blueberries to his pick-your-own operation, which includes a few acres of orange trees and avocados, is so far proving to be a good source of income, he said. Soffel is typical of the decreasing number of local growers. They are constantly threatened by urbanization and its accompanying regulations. Soffel is a fifth generation farmer whose ancestors came from Oregon by wagon. 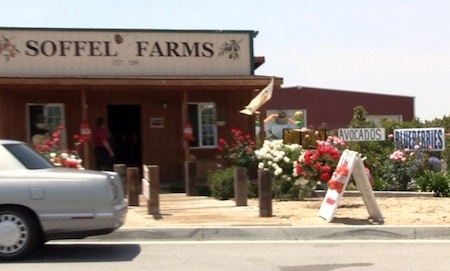 The Stoffel Farms sign reads, "Established in 1914." Soffel says his family was among the pioneers that made the Redlands area famous for its oranges. Most orange groves are gone and have been replaced by housing and commercial buildings; but Soffel and his family refuse to cut their roots to farming. "I'll be a farmer forever," he told me. I hope so. I'm waiting for word about his avocados being ready for picking. Paul Willems, who co-owns Berry Lady Farms in Kingsburg with his wife Gayle, said berry season is a happy time for him and his family. He attributes their sunny disposition to all the blueberries in their diets. Gayle Willems said the fruit may stimulate serotonin in the brain, providing a calming effect. But, she added, the good feelings may not be just the blueberries. "It makes us feel better anytime we eat healthy, right?" The Willems may also be particularly happy during blueberry season because of the success of their 100-acre farm. The couple grows and sells 12 blueberry varieties over the season at a farm store, farmers markets and through conventional channels. Blueberries are expensive to establish and require a great deal of hand labor for harvest, but they are the second-most valuable crop per harvest acre, after cherries, according to the California Blueberry Association. The California blueberry industry is growing at a healthy pace, and with 6,000 acres producing about 30 million pounds of the antioxidant-rich fruit, the industry’s volume has now surpassed Florida, said UC Cooperative Extension farm advisor Manuel Jimenez. 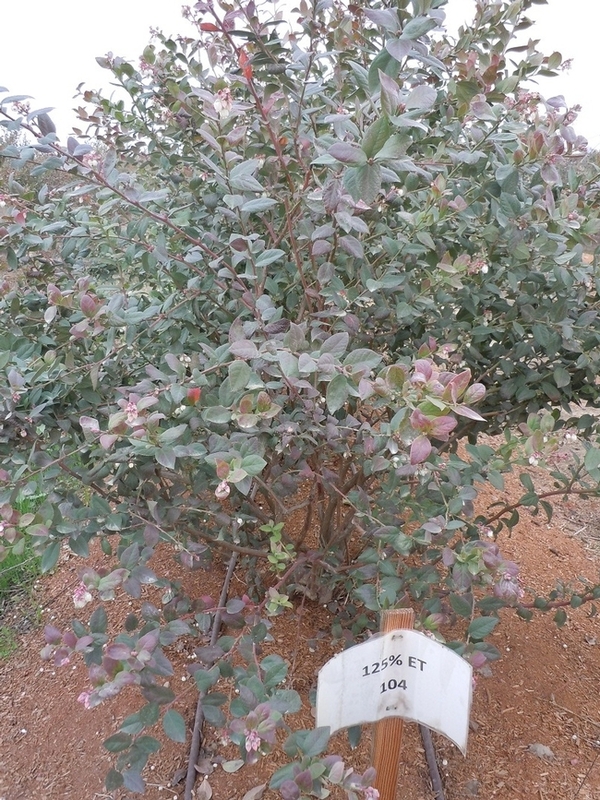 The milestone is significant, since the southern highbush blueberry cultivars grown in California originated in the Sunshine State. Southern highbush cultivars are well adapted to the California climate because they require fewer “chill hours” to produce fruit. A leader in the development of the California industry, Jimenez has conducted blueberry observational trials – looking at yield and flavor characteristics – for more than a decade at the UC Kearney Agricultural Research and Extension Center in Parlier. 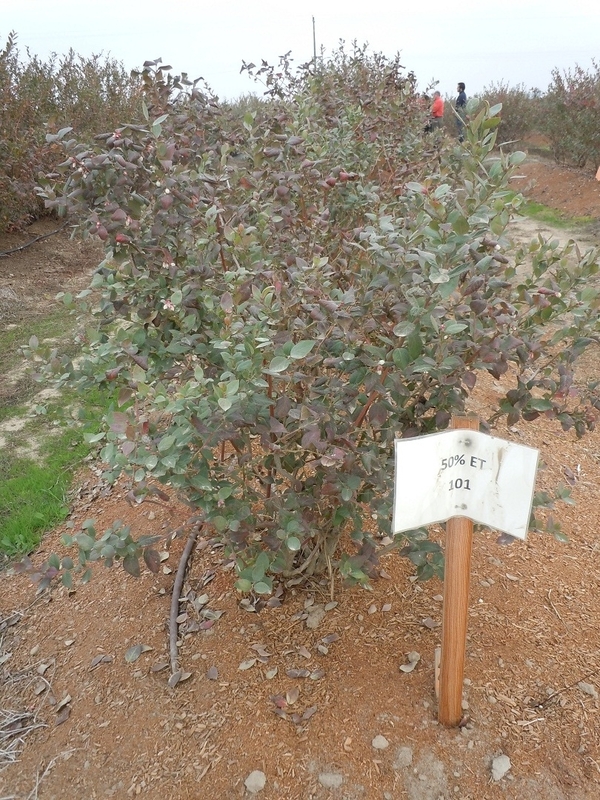 In addition, the Kearney blueberry plantings have been the scene of ongoing studies on plant spacing, mulches and pruning, research that has helped farmers successfully establish the crop in the semi-arid San Joaquin Valley. Jimenez will invite blueberry farmers and those considering entering the industry to Kearney this week to taste and compare 35 varieties of berries. Looking over the plots, Jimenez said it wouldn’t be difficult for a farmer to use information from the Kearney trials to select good-tasting berries that ripen sequentially for months, extending one farm's blueberry season from spring until mid-way through the summer. For more information about the blueberry meeting this week at Kearney, see the flyer. Gayle Willems at the Berry Lady blueberry stand, which sits inside the farm's packing house. It looks great, but does it taste great? Taking a look at melons, berries, tomatoes, pears, stone fruit, and more, researchers from UC Davis, along with collaborators from the University of Florida, are focusing on increasing consumption of specialty crops by enhancing quality and safety. Funded by the USDA, work on this Specialty Crops Research Initiative (SCRI) grant began about a year ago. Americans, after years of hearing that fresh produce is valuable for numerous health benefits, have still not significantly increased their consumption. So, why don’t we eat more fruits and vegetables? Researchers believe that the key reason is that the quality of produce is inconsistent – often with poor texture, flavor or aroma. It might look beautiful on the outside, but when you take a bite – Ugh! It just doesn’t match up to its attractive exterior. Most produce found at the local market is harvested from the field or orchard before it is fully ripe, shipped a long distance, and then the ripening is completed at a regional produce distribution center or at the local market. 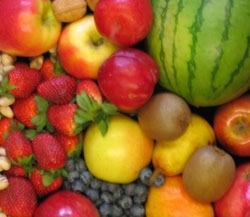 The SCRI grant is an ambitious effort to understand what characteristics are critical for consumers to enjoy produce and develop better methods to measure flavor quality, then work with better tasting varietals and improved shipping and handling practices to allow economically viable delivery of truly delicious fruits and vegetables. Consumer focus groups are being interviewed for their input, trained taste panels are enjoying a variety fresh produce, and experiments with pallet shrouds and other modified atmosphere transportation experiments are underway.  Significant information has already been elicited from consumer groups. Through focus groups, the investigators have discovered that aroma and texture are nearly as important as sweetness, and shoppers get really irritated when produce looks good but tastes bad, and this keeps repeat purchases to a minimum. Produce managers also have a tough time: set up displays of produce, keep it at the right temperature, watch people wandering around squeezing everything to see if their firmness requirements are met, meanwhile damaging the fruit. It’s a tough market for fresh fruit these days, with fewer consumers’ dollars allocated for produce purchases, but with the advances researchers are making through the SCRI project and others, sweet success is on the way.